Do you know the most influential military genius in the world, Napoleon Bonaparte? The man who can fight against the opponents while they are overwhelming with both the number of troops and full arsenal. Also, his opponents are all considered the greatest military commanders of all time. And nowadays, Napoleon’s fighting strategies are currently being studied at military academies around the world. 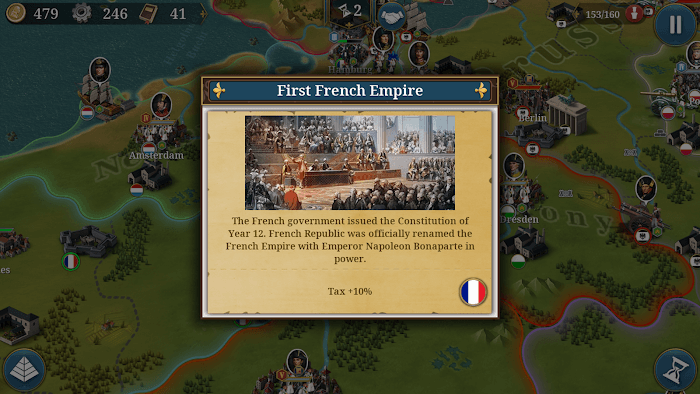 Also, with the title of European War 6: 1804, he transforms into a talented man named “The Little Corporal” and combines with the generals under his leading to rule the world! With the crowned of a King in 1804, many other empires were under threatening and invading the territory. Get up and start developing your empire. Build it into a kingdom that no one can invade, and destroy all those who are plotting wicked with your nation. 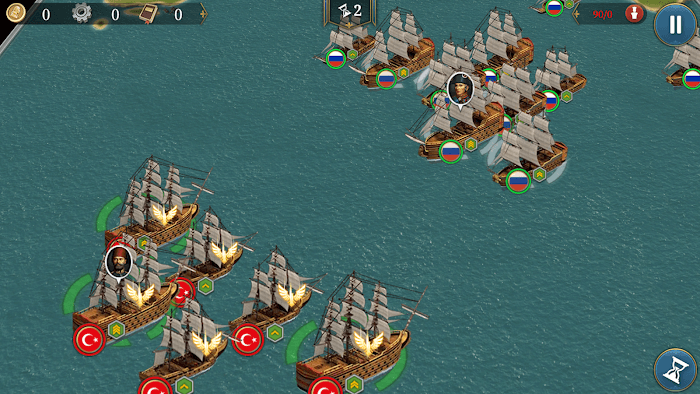 Coming to Europan War 6: 1804, this game will take you back to the 18th-century European battlefield. Brutal invasions to aggression the colonies, slave possession, exploit and the hegemony of Europe and the whole world. As a head of a country, you must prevent this from happening; your task is to command the military forces to fight the enemy and destroy all the troops that you find on the map. However, in order to win on the battlefield, plans are not enough, you need to prepare, train your forces with excellent skills, along with extremely hard tactics and strategies. Good luck, making the enemy terrified and cannot escape from your pre-arranged plan. 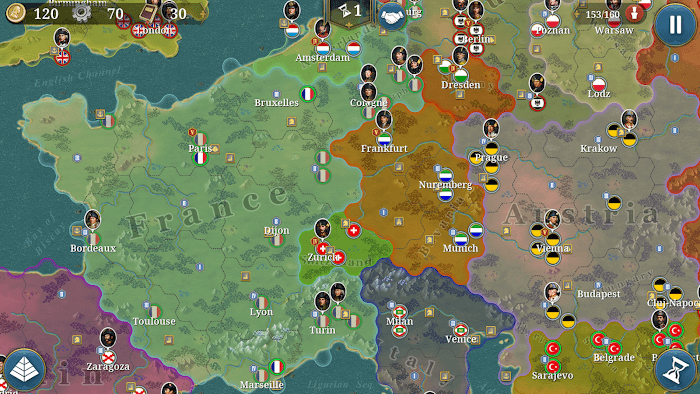 This game has quite complex and interesting content for players, with more than 10 chapters: Declaration of Independence, Canadian Power, Holy Roman Empire, King of Europe, Ottoman Empire, Empire Britain, the liberation of South America, … They have different backgrounds and happenings along with more than 90 confrontations on the battlefield. This is a fierce record in history that you can change in your game progress. Engage your name in the history of Europe, claimed that your empire is the strongest and is willing to destroy and smash other realms to become a hegemonic empire. The military forces and unique strategies are waiting for you to come and become the commander. Famous generals of the world, along with many of the elite military units trained by you are at your fingertips. Stand up and wipe out all the little states, especially the Ottoman Empire, and the British Empire. They are mighty empires are plotting to invade your kingdom. 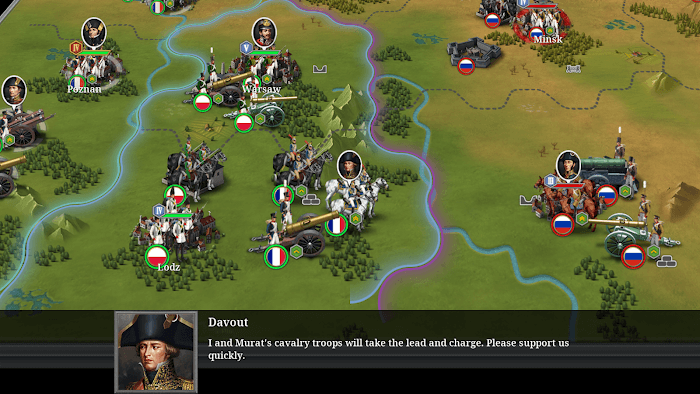 Get involved in the game and enjoy the full of firefight right now with European War 6: 1804 and Napoleon right away! Sangoku Justice APK – Apocalypse of Japan? It keeps crashing any reason why?